Smart Cities oder: Wie intelligent ist smart? The FIRST step sets the ambitions for the project. During the THIRD step, the roadmap will be created. During the final and FOURTH step a project portfolio will be generated with new projects and initiatives to reach the ambitions. At the end of the project each partner city will each have: > 2 future scenarios > 2 roadmaps > 1 portfolio of individual and joint projects to implement sustainable energy policies and measures. LEARNING COMMUNITY ACTIVITIES AND CROSS-CITY LEARNING They will be organized to guarantee that new projects will have to explore many new roads stating cross-learning objectives to grow in higher pace as a learning community. THE MAIN TARGET GROUPS OF THE R4E PROJECT ARE: > Public sector decision and policy makers at local, regional, national and European level. > Universities and research centers involved in activities related to Energy related topics, and more specific to the three focus areas of R4E. > Other relevant networks, projects, companies and organizations involved in Energy related topics, and more specific to the three focus areas of R4E. > Local stakeholders relevant to local energy policies (citizens, public and private organizations and knowledge institutes). WHAT ABOUT SAVING ENERGY? The R4E project focuses on developing the instrumentation and the skills and capacities for local authorities to make more realistic and better implementable strategies and action plans built upon a more in-depth knowledge of the state of technology today. R4E Project Partners WHO’S BEHIND? The R4E consortium consists of 10 partners, 8 cities and 2 knowledge partners, from six countries: the Netherlands, Italy, Turkey, United Kingdom, Spain and Estonia. The Project coordinator is the city of Eindhoven (NL), while Eindhoven University of Technology (TU/e), more specifically the TU/e LightHouse, experienced in developing Visions & Roadmaps for municipalities, has a major role in the process of R4E, supporting and guiding each partner city through the entire process. 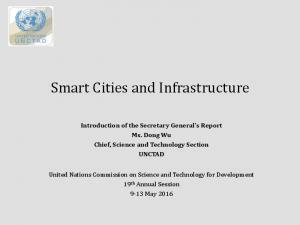 Report "A SMART PROJECT 4 SMART CITIES"